Photo Credit: Vermont Catholic/Cori Fugere Urban - Father Jon Schnobrich applauds at an ordination at St. Joseph Cathedral in Burlington. As a man enters formation for the priesthood, the seminary seeks to instruct and prepare him in four primary areas: human, spiritual, intellectual, and pastoral. 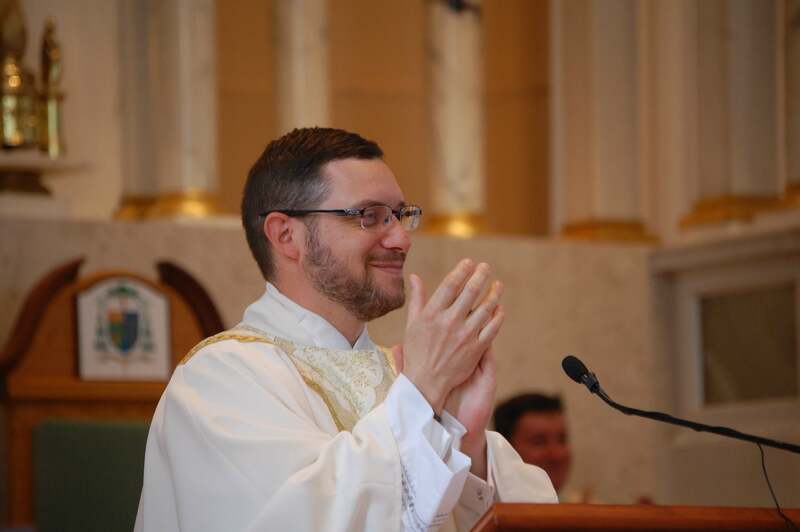 Seminarians are evaluated and stretched in these areas constantly throughout their time in priestly formation because, as they continue to discern God’s will, the Church is discerning with them. What is the Church seeking in those who are discerning a call to the priesthood? The heart of a shepherd. Our Lord taught His disciples, “I know my sheep, and they know me.” Throughout their formation, seminarians are assigned to a variety pastoral field placements where they apply the intellectual knowledge to the concrete situation of the souls before them. These experiences, intended to conform their hearts to that of the Good Shepherd, may include serving the poor with St. Teresa of Calcutta’s Missionaries of Charity, teaching catechism at a local parish or school, ministering to the elderly, giving tours at a local shrine or basilica or shadowing a priest in his assignment at a parish or hospital. Pastoral formation seeks to integrate all the elements of priestly formation in order that the heart of the priest and his actions toward his people in every situation would manifest the heart of Christ, the Good Shepherd, who came not to be served, but to serve with love in truth.